The set list was classic 1970s Skynyrd, even though the band has made eight studio albums (not counting the Christmas disc) since reuniting in 1987. Van Zant is a chatterbox with endless mindless lines like “we don’t call you fans. We call you Skynyrd Nation.” The Nation numbered 7,692 people at the grandstand. 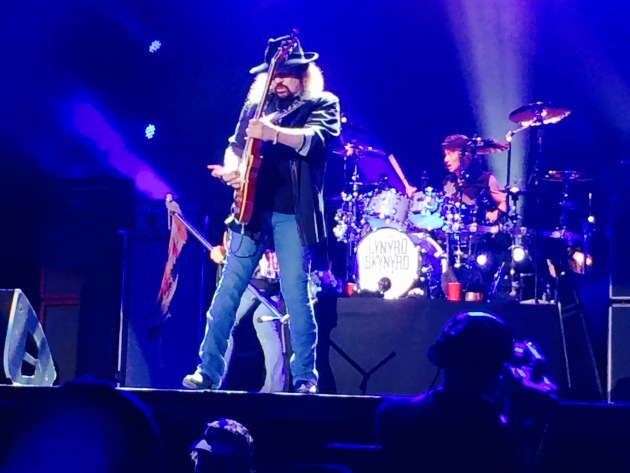 Stolid guitarist Gary Rossington, the last of the original band members, leads with quiet strength. 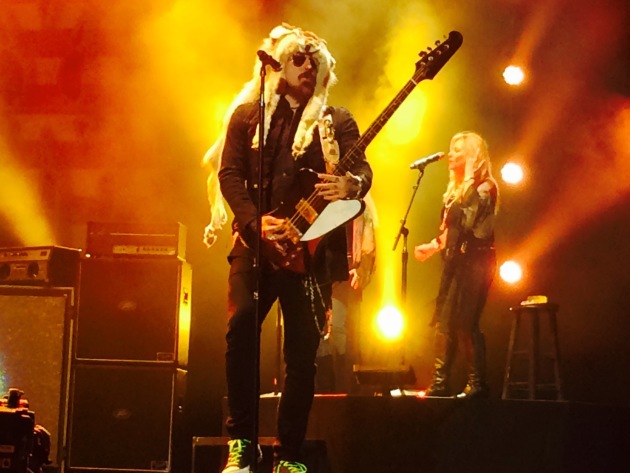 Bassist Johnny Colt, formerly of the Black Crowes who joined Skynyrd in 2012, wore a series of distinctive hats, in the tradition of the late, longtime bassist Leon Wilkeson. Never a jam band, Skynyrd sounded tight, crisp and forceful. This might have been the best concert of 1977 if singer Van Zant, whose style is crowd-pleasing nonchalance, had half the fire of his brother Ronnie Van Zant, the band’s original lead singer until his death in a plane crash in 1977. With their beards, long hair, leather, tattoos and sunglasses, the Skynyrd guys look like they’re wearing uniforms. With all the long hair (including backup singers Dale Krantz Rossington and Carol Chase), Skynyrd should be getting some kind of hair-product endorsements. Don’t cha think? Skynyrd always gets credit for the soaring guitars on “Free Bird” – which lasted 15 minutes on Thursday – and the swaggering anthem “Sweet Home Alabama.” But the original songwriters crafted some great hooks like “Gimme Three Steps.” However, the highlight for me Thursday was the one song that Rossington and Ronnie Van Zant didn’t write – J.J. Cale’s “Call Me the Breeze,” a really swingin’ tune that kept getting better with every verse.